Your aircraft requires routine annual inspections. We make it fast and easy. We perform comprehensive aircraft inspections in a timely, cost-effective manner, so you can get back in the air and fly with confidence. Our goal is to help you keep your aircraft performing in peak condition. Your aircraft requires routine annual inspections. We make it fast and easy. We perform comprehensive aircraft inspections in a timely, cost-effective manner, so you can get back in the air and fly with confidence. Keep your plane performing in peak condition. We are the only full-service Part 145 repair station in Birmingham, Alabama. We have a full staff of licensed mechanics capable of performing comprehensive routine inspections and diagnostic services for your aircraft to ensure that you can fly with confidence every time. We’re among the most experienced in the industry and turn our passion for flight into solutions for you. Our technicians understand the impact of delays and associated costs, so we strive to efficiently and cost-effectively deliver a safe and ready aircraft every time. 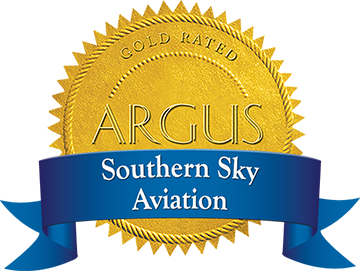 Experience excellence in aviation inspection at Southern Sky Aviation and see where we can take you.